Some works of art seem to inherently invite a slower, more involved viewing experience. 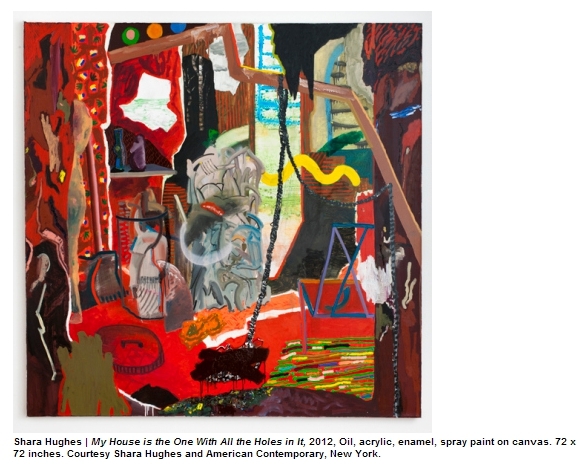 New American Painting contributor Brian Fee would agree in regards to Shara Hughes’ richly colored paintings currently exhibited at the American Contemporary in New York. In his review of her work, Fee takes the idea of looking slowly to the next level. The word “slow” can make us think of being lethargic, but looking and engaging with a work of art, as Fee suggests, is a lot like physical exercise. He describes visually exploring Hughe’s paintings as “giving your oculars a calisthenic workout,” and warns against an un-energetic approach (“Go into this half-heartedly and you’ll leave with soft-scrambled brains”). Hughes’ bold and adventurous paintings certainly do exude energy and invigorate the viewer. Take a slow (but intense) look at her paintings through Lee’s eyes in his review or through your own at the American Contemporary and get in a visual and imaginative workout. These paintings are amazing! Even just looking at them on my computer monitor I can tell how vibrant and intricate they are. I wish I could see this exhibition in person – unfortunately the slow art experience just isn’t the same when you’re looking at reproductions of the art on a computer rather than in person. These paintings have an interesting tactility to them… the skewed perspective allows certain elements of each painting to reach out to the viewer, drawing him/her into the painting and its vibrant movements. I feel like I’m being enticed into a dance! Excellent point in that looking slowly does not meant lethargically, Naomi! Hughes’ work definitely is a great example of how ‘seeing’ can be an active, and thrilling experience. Thanks for sharing!